Planning to park your car near Urquinaona metro station, are we? Parclick offers you a wide choice of car parks that might be of some interest. As we’re sure you already know, finding a space in the city centre of Barcelona is a real challenge. The majority of the streets are in the blue or green zone (only for residents), even on Sundays or public holidays. Get ahead of the game and book yourself into a car park in the heart of Barcelona. Urquinaona is a metro station (lines 1 and 5) on Via Laietana, a street in downtown Barcelona that crosses the Ciutat Vella to connect Eixample with the port. The station has become one of the top dogs, as far as metro stations are concerned, because of its relatively central position. 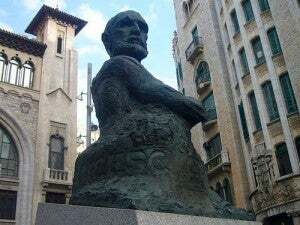 It has gained a bit more recognition as it bears the name of a former bishop of Barcelona; José María Urquinaona y Bidot and, anecdotally, the Spanish singer Joaquín Sabina evoked it in his song Ay Calixto on the album "Diario de un Peatón". If you find yourself wandering around, twiddling your thumbs, try a visit to the Silk House, the Caja de Pensiones or the Catalan Music Palace: three beautiful historic buildings located less than 3 minutes’ walk from the metro. Being able to use your car is always a plus, ​​provided you have a guaranteed parking space. If you are planning your trip down to the last detail, there is no reason why you shouldn’t include the reservation of a parking space. With Parclick, you have more than 100 car parks in Barcelona at your disposal. Take a look at our suggestions!